I had an ephiany about a year ago. I dislike raw veggies. (except carrots.) the rest, well, they are not my favorite. But roasted? I have eaten a head of cauliflower by myself. In one sitting. So now I make TONS of roasted veggies. And my 7yo loves them just as much as I do. If I say we are having asparagus he will ask, roasted? With olive oil and sea salt? He says this longingly and then steals them off my plate. EXACTLY! Roasting makes your kids request veggies. 'Nuff said. I started roasting frozen broccoli this week. My veggie hating kids loved them. I did too. It is a huge hit. Love, love it. Interesting! Did they turn out crispy? Most articles I've read say you should NOT try roasting frozen veggies, because their cells are going to be too compromised by the freezing process to really get that crispy exterior and creamy interior. Maybe try it with fresh broccoli too, and let me know the difference? I'd love to hear. We also love roasted vegetables. 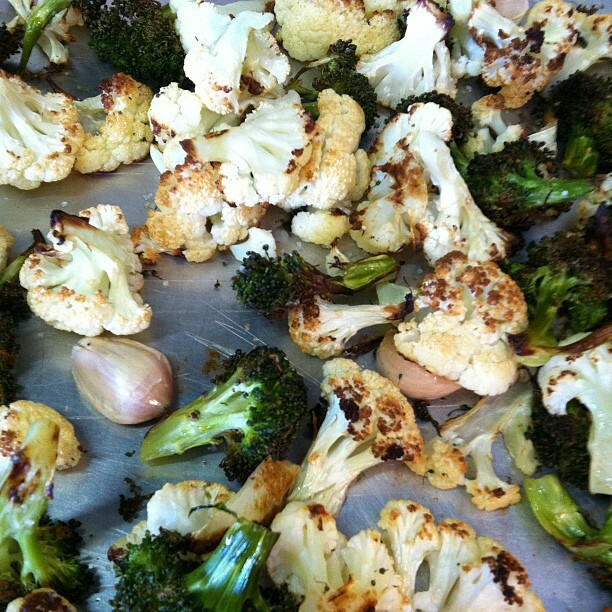 We do not love the smell of roasting broccoli and cauliflower, but we suffer the smell for the great taste. I'm one of the weirdos that's always liked broccoli and cauliflower. I'd never even heard of roasting either vegetable before this year but I am a huge fan of roasting other veggies. I can't wait for my CSA to start back up so I can give this a try! Mmm... I love roasted veggies! My husband and I were just having a conversation about why our parents always boiled veggies - they were terrible! No wonder we hated green beans and broccoli and anything healthy - they taste like cardboard when they are boiled! Anyway, we roast veggies now with a little olive oil and salt and bam: delicious!